Villa L'Aimée is a luxury bed and breakfast which can take up to 6 guests at any one time depending on availability of rooms. We are able to take 2 guests per room only and it is not available as a rental property. Please always check availability of rooms with owner before reserving a room. High Season 1st May - 1st September: Green Room 147 Euros per night, Blue Room 137 Euros per night, Gold Room 117 Euros per night. Breakfast and taxe de séjour are included in the rates. Low Season 1st September - 30th November: Green Room 137 Euros per night, Blue Room 127 Euros per night, Gold Room 112 Euros per night. Breakfast and taxe de séjour are included in the rates. Villa L'Aimée is closed during the months of December, January, February & March. Villa L’Aimée is a beautiful belle époque style villa built in 1929 which has been totally renovated by the present owner. The house is set in the quiet residential quarter of St Maurice and overlooks the beautiful Park Chambrun and the Temple de Diane. The guest rooms are situated on the first floor of the villa which has its own entrance. Each of the bed & breakfast rooms have an en suite or private bathroom or shower room. 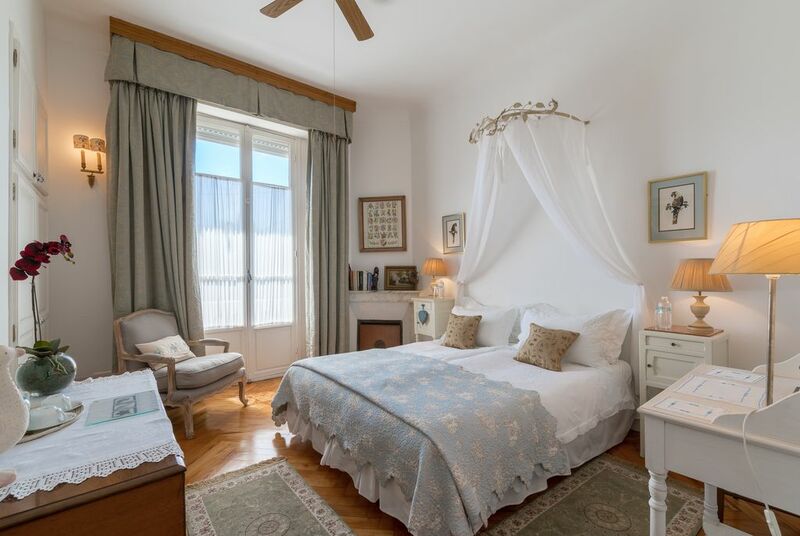 The rooms are decorated to an extremely high standard and the two large double bedrooms have French doors leading to balconies overlooking the garden. Guests can enjoy the privacy of a paved garden on the ground floor or can take a walk in the beautiful Parc Chambrun next door. Breakfast is served on the second floor in the owner’s beautiful dining room with stunning views overlooking Nice, where guests can enjoy locally baked breads and pastries, fresh fruit salad, freshly squeezed juice and eggs of their choice. Please note that the calendar only shows up as being blocked when all three rooms have been reserved and there is no availability at all. Always check with owner should you wish to reserve a specific room. The villa is situated two stops from the airport on the A8 autoroute and is extremely well serviced with an airport bus leaving every 15 minutes from Terminal 1 and terminating at the bottom of Avenue Piatti – 2 minutes walk from the villa. The villa is a 10 min walk from the tram which takes guests down to the old town and beaches in 8 mins and also passes via the main SNCF railway station stop. Getting around Nice and it's neighbouring areas is simple, cheap and easy if guests prefer not to hire a car. Avenue is a private road and parking is for residents only, however for those arriving by car, there is free parking in all the surrounding roads. We regret that we are unable to take children under the age of 12 years of age. English owner living 15 years in France with lots of local knowledge of the surrounding area. A background in cooking and plenty of travel. Nice is the undiscovered city of the riviera. Many tourists fly into Nice and stay elsewhere which is a pity as it is such a beautiful city and has recently had a complete facelift. The city is small and easy to get around with a new tram system which is cheap and convenient to use. It makes a brilliant base and the surrounding areas are easy to get to from the station and bus station. The buses are brilliant as you meander along the cliff tops and don't miss the views. The property is set in a quiet secluded private road tucked away from the noise of Nice city. It's a quick walk to the tram which takes you down to the old town and beaches and, for those that like to walk, it's a stroll of 35 - 40 mins down. I often walk the dog down and take the tram back. The local square wants for nothing and you can find just about everything you wish for in the way of traiteurs, bakeries and boulangeries including banks and a pharmacy. A village within a city. All bathrooms have a bath or shower with toilet and wash hand basin. Bath towels and soap/gels are provided. Bathrooms are cleaned each day. 10 min walk to tram. 5 min walk to beach. Regrettably we are now obliged to ask that guests do not use any tanning lotions, sun lotions or hair dyes whilst occupying the rooms at Villa L'Aimée. Avenue Piatti is a private road and parking is for residents only however, there are 2 parking spaces for guests on a first come first serve basis. Free parking in surrounding roads. Breakfast only in dining area. Each room has a selection of books in the wardrobe. We ask that if you take a book from the wardrobe, you leave one in its place. There is a garden on the ground floor with chairs and table where guests can enjoy an evening drink before wandering out for dinner. There are 3 tennis clubs located within walking distance. Notes on accommodation: Free WIFI in villa. Not suitable for children under 12 years of age. Free parking in area. Smoking is allowed in garden only. Small garden for guests to enjoy an evening drink. Please note that we are bed and breakfast only therefore there is no facility for self-catering. First impression was exceptional. We were two couples that enjoyed the Blue and Green Rooms. They were very comfortable and exceptionally clean. We were conveniently a ten minute walk to the tram that would take you to the Old Town Center and beach. It was a delight meeting our hostess Toni AKA: La Femme Anglaise. She was hospitable, kind, and informative. She prepared plentiful breakfasts every morning. On our departure day she went to the extent to prepare us a basic meal the night before for our sake. We highly recommend everyone to stay with Toni so you too can expeirience Nice hospitality. This is simply the most wonderful bed and breakfast we have ever stayed in! The breakfasts were the best we've had anywhere in France and were just the right amount to keep us going most of the day whilst sightseeing. Toni has an excellent knowledge of what to do and where to go - she planned our days for us and public transport took us around the Alpes Maritimes at a cost of 1.50 each. We didn't have a car and we found getting around very easy. Toni suggested and booked us into lots of very good restaurants as well - we'd would never have found them without her help. She knew exactly which ones would suit us and we couldn't have done better. The rooms are just fabulous with really comfortable beds and beautiful linens and furnishings - it really is a home from home. A cleaned bedroom and fresh thermoses of iced water greeted us each evening on our return and we enjoyed a glass of the local vino in the garden before heading off for dinner. This was really one of the most enjoyable holidays either of us have ever had and we highly recommend visiting this quiet and hidden away gem. Spend the day on a sunny Nice beach - these can easily be accessed by tram, an 8 min walk from the villa. All along the beaches one can either hire beds and eat in the beach restaurants or lie on the public areas. Villefranche, Antibes or the Cannes beaches can be accessed easily for the day by train or bus. Arriving at the airport you take a number 23 bus from outside arrivals at terminal 1. The number 23 bus comes across Nice to the end of our lane. We recommend you don't hire a car unless absolutely necessary. Hiring a car can be done by the day at the station 5 mins on the tram. Arriving at the station we are a 10 min taxi ride. The villa is 3 stops from the station by tram and then a short bus ride. Contact owner for printed directions. For day trips to Monaco, Cannes, Antibes, St Paul de Vence or other villages and towns take tram down to the Gares SNCF (railway) or to the old town for buses. Nice has an excellent scheme whereby the public can travel anywhere in the Alpes Martimes for 1.50 Euro per person on a Solo ticket, or for 1 Euro on a Multivoyage ticket, travelling in one direction for 74 minutes. During the summer months there is a boat leaving the port for day trips to St Tropez via Cannes and Îles de Lérins. Cafés, banks, Spar shop and a pharmacy in the local square are 5 mins walk from the villa. A minimum of a 2 night stay is required unless booking through Villa L'Aimee's own website.